New to Fairmont this year, Mr. Brandon Adame says he’s excited to be working at a school that utilizes classroom technology such as Promethean boards and Accelerated Math. In fact, he’s already seen the difference it makes in his lessons. 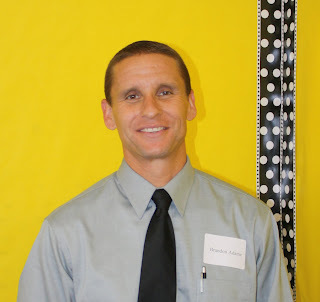 Mr. Adame is entering his fifth year of teaching with a background in first, second, and third grade. He enjoys a healthy lifestyle, staying fit with a vegan diet and plenty of outdoor exercise including surfing and trail running. He loves animals, especially his dogs, Barney and Smokes, and cats, Marlo and Killian. He hopes to one day earn his Master’s Degree in Education. Three things you might not know about Mr. Adame: he has a twin brother, he has run a 100-mile race in under 24 hours and, in sixth grade, he switched classes with his twin brother (and the teacher was none the wiser)! Welcome, Mr. Adame. We’re glad to have you on our team.